Good morning readers! 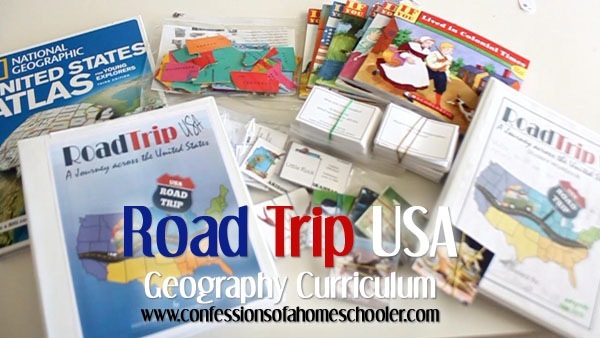 I promised to do a video review of my Road Trip USA Geography & History curriculum, and I’ve finally had a chance to get it uploaded for you all. We had so much fun using this curriculum to learn about the United States! It’s packed full of interesting state facts, symbols, crafts, recipes, activities, and more! Want to see more details on what it looks like? Check out my Road Trip USA Video below! So I hope you’ll come along with us on an exciting journey learning about the U.S.A! From the signing of the Declaration of Independence, to the wild west, you’ll uncover all the secrets this Nation has to offer! Within this curriculum you’ll discover the sights and sounds of all 50 states, including state symbols, U.S. Presidents, famous people, landmarks, historical events, and much more! For you history buffs, this is a great introduction for young learners! You will start out learning about the Constitution, Declaration of Independence and Revolutionary War. Then you’ll move south to learn more about the Civil War and Underground Railroad. From there you’ll journey with Lewis & Clark through the mid-west, live with the Hopi in the southwest, then venture out into the wild west on a covered wagon ride! What age is this for? These unit studies are intended for elementary students ages Kindergarten – 6th grade or so, but I’d even use it for 7th grade. –>Click here to download a sample<– Want to join in on the fun? Head over to my store to get your copy of the curriculum, then grab your Travel Logs, and pack your bags! It’s time for a Road Trip! Hi Erica! I had a quick question…I’m sure it’s been asked before but I looked and was unable to find any previous feeds addressing my question. Our family would like to complete both of your geography studies but we are unsure as to which program we should complete first… Road trip USA or expedition earth. Which of these two programs do you recommend to be completed first? Not sure if it matters but we do have a preschooler,kindergartner, third-grader, and a fourth grader. Thank you so much for your help we really do love all the curriculum and planners that you offer. Looking forward to hearing from you thank you! Thank you Erica! We will give it a go! Thanks for the great video. We have enjoyed many of your resources throughout the past few years. I just have a quick question. We are using My Father’s World Adventure in U.S. history this year. Is it possible to just buy a few of your resources (flashcard, animal cards, etc.) instead of the whole thing? I would love to incorporate a few extras into our curriculum. Thanks! Love your website! I’m sorry, right now it’s only available as a whole set. I received this many years ago. I think I may have proofed this for you? :0) Anyways was thinking of teaching this again and decided to refresh my memory on the unit so I watched the video. I was wondering if you revised this? My DE info has nothing about the Amish or the Air Base. The bridge page is different too. Hi Erica, we actually completed both of your geography units about 2 years ago and I too was wondering if they had been revised. Our family greatly enjoyed both units. Thank you again for them. Just watched your video tonight and someone had posted this about a postcard exchange. I recently purchased the Roadtrip USA curriculum and wanted to mention that the state postcards include this wording: “Do you like this country why or why not? …What are the people like here?” I am assuming this is a carry over maybe from Expedition Earth but wanted to alert you to it. Hello Erica! I’d like to start your Road Trip USA with our kids this summer. We are taking a trip to Yellowstone and the Grand Tetons this summer, and I’d love for them to follow along throughout our trip. I would love any advice, thoughts, recommendations, and tips.